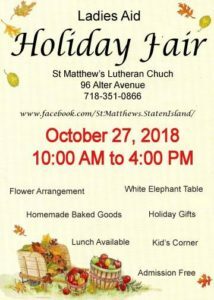 Prayer List | Welcome to St. Matthew’s Lutheran Church on Staten Island, New York. The members of our church family would like to pray for your needs and those of your loved ones, during our Worship Service. If you would prefer to speak with the Pastor, please call the church at 718-351-0866. May the love and comfort of the Holy Spirit be with you always.